You call it sinister, I call it beautiful!!!! What a real beauty. Look at those gorgeous eyes. OOhhh papi! That is absolutely gorgeous (if not a little creepy). I have to agree with DIMA, ai papi! There are some sinister geckos out there! I've been around one that everytime you open his cage he jumps up and lets out a little hiss at you! I love these guys. Its the tokay geckos you need to worry about. This looks like a cartoon character. He might be able to find a job selling something! 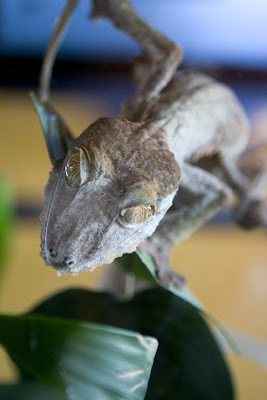 It's a mossy leaf tailed gecko, Uroplatus sikorae.